Teeth that are misaligned or crooked can cause dental health issues and aesthetic concerns. Traditionally, braces have been used to correct misalignments. Braces use a series of metal brackets and wires to straighten teeth. 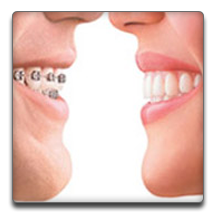 Braces can correct a number of orthodontic issues ranging from mild to severe. However, they do have some drawbacks. They can make it difficult to keep your teeth clean, and many people dislike the obvious metal look of braces. Our specialist for Invisalign in Torrance may be able to offer you an alternative. Invisalign uses a series of clear plastic aligners to straighten teeth over the course of a year or sometimes longer depending on your customized treatment plan. The trays are removable so that you can enjoy your favorite foods and drinks without worrying about damaging your appliances, and you can continue to brush and floss your teeth just as you always done without the need for special tools. However, you will need to wear your aligners for at least 20 to 22 hours every day for the best results. As with traditional braces, Invisalign can be used to treat numerous alignment problems and malocclusions. Because there are no wires to poke or brackets to rub, treatment is often more comfortable. Patient compliance is essential since you will be responsible for wearing your aligners and even changing them on the recommended schedule. Contact our specialist for braces in Torrance to learn more about Invisalign or other orthodontic treatments or to schedule your consultation.